Hello everyone and great to connect with you again after a busy summer. The Horn Lake Library had a remarkably full summer calendar and we are most grateful to Living Word Ministry in Walls for providing all children (birth - 18 years old) with free lunches and snacks. You can't learn when you are hungry and all of our programs encourage learning creativity. More great news - for the year - out of 14 branches in the First Regional Library system, Horn Lake had the 2nd highest computer usage with 40,347 and the highest yearly attendance for all programs at 45,265. Please, continue to join us as we listen to your wants and needs to create opportunites for growth, learning, friendship and fun. We are excited to introduce a bi-monthly workshop for youth and young adults - Rising Up Anew. Led by educator Maggie Carter, topics will flow with participant questions and input. Subjects can include positive thinking, finding your strengths, starting over after incarceration, self-worth / positive self-esteem, setting goals, encouragement for young parents, coping with stress, peer pressure, determining your dreams and working to make them come true and looking for the rainbow during the storm - never giving up when bad things are happening. Our on the go Seniors in Action group proves that the busier you are, the more you can do. Each month this dynamic group celebrates something new, informative, untried and just plain fun. Our multi-lingual and charismatic Youth Specialist, Mrs. Marta Smally, returns for another jam packed school year with bilingual (English/Spanish) workshops for babies - adults. 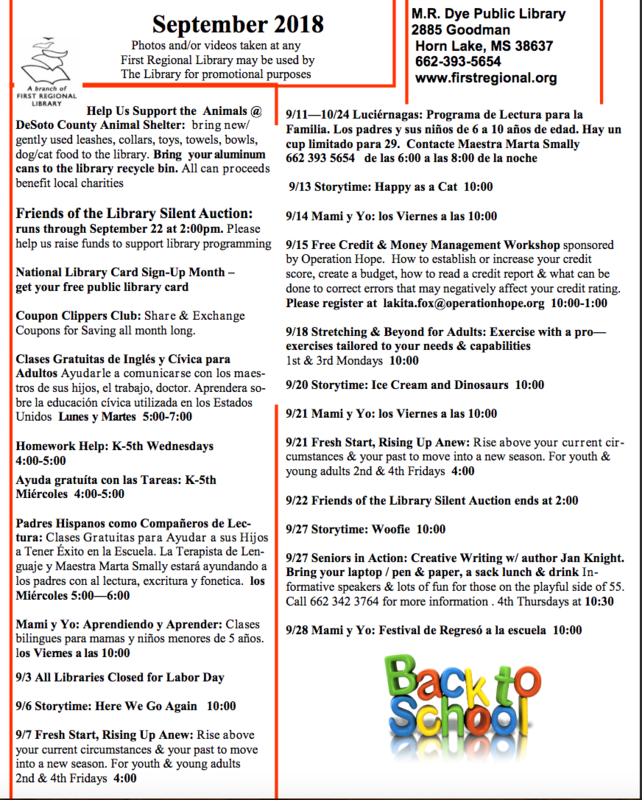 Included in the bilingual non-stop line-up is Mommy and Me, Homework Help, Storytime, Adult Language and Civics, Families Learning Together, Health and Nutrition, Family Literacy, Time for Mom and Computer. We are proud of our participants who are learning English using the U.S. Constitution and are studying to pass the U.S. Citizenship test. Mrs. Smally is trying her best to squeeze in another very important workshop - teaching Spanish to native English speakers. We have had many requests from schools, teachers, civic leaders and business owners for this series. As soon as we can determine a time that would work for most, we'll let you know. Behind the scenes, many of these programs represent collaborative efforts and grant funding from charitable and non-profit foundations and state and federal sources. Operation Hope is bringing hope to Horn Lake with a year long series of free Credit and Money Management workshops. For adults, this is the series that will help ease your frustrations, help you create a budget and provide opportunites to establish / re-establish your credit score. We work as hard as we do - for you. We are thankful for each and everyone who depends on the library for information, networking, assimilation, learning opportunites and socialization. We look forward to another great year with you! Horn Lake Middle School Broadcasting Team Visits Channel 5! Middle School Family Guides for ELA & MATH!